A basic necessity for performing early music is reading the score in facsimile (a copy of the manuscript or the edition of the time). The facsimile in the 18th century shows us a big part of the instrumentation, the few indications of dynamics added by the composer and the original handwriting, without all of the invented additions (tempi, dynamics, slurs, instrumentation, titles…) of the horrible modern editions. In the baroque period, generaly speaking, the composers did not compose an abstract piece, but composed for musicians that the composers knew. According to Harnoncourt, if the musicians could not perform well their pieces, this didn’t mean that the musicians were mediocre, but that the composer did not compose his work well enough for the musicians he had at his disposal. The 6 so-called Brandenburg concerti (BWV 1046, 1047, 1048, 1049, 1050, 1051) have the following title: “Six Concerts Avec plusieurs Instruments Dediées A Son Altesse Royalle Monseigneur Louis, Marggraf de Brandenbourg etc. etc. par Son tres-humble et tres obeissant serviteur Jean Sebastien Bach, Maitre de Chapelle de S. A. S. le prince regnant d’Alhalt-Coethen”. They were composed mainly in Cöthen (the Concerto no. 6 was probably composed in Weimar). They were a present from Bach to the margrave of Brandenburg (Christian Ludwig). The manuscript is dedicated to the margrave, dating March 24, 1721: “A Son Altesse Royalle Monseigneur Crêtien Louis Marggraf de Brandenbourg &c. &c. &c. Monseigneur. Comme j’eus il y a une couple d’années, le bonheur de me faire entendre à Votre Altesse Royalle, en vertu de ses ordres, et que je remarquai alors, qu’Elle prennoit quelque plaisirs aux petits talents que le Ciel m’a donnés pour la Musique, & qu’en prennant Conge de Votre Altesse Royalle, Elle voulut bien me faire l’honneur de me commander de Lui envoyer quelques pieces de ma Composition: j’ai donc selonses tres gracieux ordres, pris la liberté de rendre mes tres-humbles devoirs à Votre Altesse Royalle, par les presents Concerts, que j’ai accommodés à plusieurs Instruments (…) Jean Sebastien Bach. Coethen. d. 21 Mar. 1721”. Bach’s autographs of the Brandenburg concerti were kept in the library at the margrave’s castle. A pupil of Bach, Johann Philipp Kirnberger, took the manuscripts and gave them to the Staatsbibliothek zu Berlin, where they have been kept until this very day. The Brandenburg concerti were published for the first time only in 1850. Concerti number 1, 2, 4 & 5 are written in the concerto grosso style (a type of concerto in which a large group –known as the ripieno or concerto grosso– alternates with a smaller group –the concertino). The instrumentation that Bach uses is totally original and very cool. Following Ted Libbey, one can say that the Brandenburg concerti combine the exuberance of the Italian solo concerto, the elegance of the French suite and the gravity of the German counterpoint: “To get the sound, style, balance, texture and articulation right, this music needs to be played on period instruments. Today, musicians in many parts of the world are capable of doing that.” All 6 concerti are in major keys. CONCERTO 1 – “Concerto 1mo à 2 Corni di Caccia, 3 Hautb: è Bassono, Violino Piccolo concertato, 2 Violini, una Viola è Violoncello, col Basso Continuo”. 1. [No tempo indication] / 2. Adagio / 3. Allegro / 4. Menuetto / Trio / Polonaise. In F Major. This is the only concerto from the collection with 4 movements (all the others have 3 movements). It was written in 1721. The violino piccolo is a small violin with strings usually tuned a 4th above. CONCERTO 2 – “Concerto 2do à 1 Tromba, 1 Flauto, 1 Hautbois, 1 Violino, concertati, è 2 Violini, 1 Viola è Violone in Ripieno col Violoncello è Basso per il Cembalo”. 1. [No tempo indication] / 2. Andante / Allegro assai. In F Major. 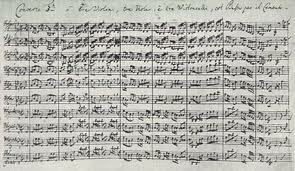 Written for 10 musicians, and between 1717 – 1718. There has been a debate whether the Brandenburg concerto number 2 is a concerto for trumpet, or if Bach had mistaken using such a weird combination of instruments (trumpet versus recorder), or if the only way to hear the recorder is to place the recorder player in the front and the trumpet player in the back. The Brandenburg concerto 2 is not a trumpet concerto, but a concerto grosso. The special combination of instruments is original and sparkling, and the result is virtuoso and majestic if it is performed with historical instruments (which are the instruments that Bach knew and the instruments for which Bach composed). If one plays with the virtuosism of the musicians and their ability to play a great variety of dynamics, the instrumentation is fantastic, special and exquisite. The trumpet part is one of the most virtuosic parts written for trumpet in the late baroque. CONCERTO 3 – “Concerto 3zo a tre Violini, tre Viole, è tre Violoncelli col Basso per il Cembalo”. 1. [No tempo indication] / 2. Adagio / 3. Allegro. In G Major. Written in 1718. The adagio movement consists of only one bar with 2 chords (a minor – B Major): a cadenza on which the cembalo or violin should improvise freely. CONCERTO 4 – “Concerto 4ta à Violino Principale, due Fiauti d’Echo, due Violini, una Viola è Violone in Ripieno, Violoncello è Continuo”. Allegro / 2. Andante / 3. Presto. In G Major. Written c. 1720. There has been a debate regarding the meaning of Fiauti d’Echo. The answer that convinces me the most is two alto recorders. Since the Fiauto d’Echo I has a number of f”#, a very good option is to play the Fiauto d’Echo I with an alto recorder in g’ (there are many surviving original alto recorders in g’ in many instruments museums in Europe) and the Fiauto d’Echo II with an alto recorder in f’ (in bar 201 of the first movement, the Fiauto d’Echo II part arrives to an f’# and in bars 183 and 227 the part arrives to an f’: for that reason the Fiauto d’Echo II cannot be performed with an alto recorder in g’). In an article that appeared in Oxford Journals (Music & Letters, 1960), Bob Thurston Dart talks about these Fiauti d’Echo: “At the head of his score of the fourth Brandenburg concerto Bach wrote ‘Concerto 4ta à Violino Principale, due Fiauti d’Echo, due Violini, una Viola è Violone in Ripieno, Violoncello è Continuo’. The identities of the stringed instruments and the harpsichord are clear enough (although we do not always observe in performance Bach’s implied direction that the work is chamber music, to be played by one player to a part), but what instruments did he mean to indicate by the words ‘Fiauti d’Echo’? The phrase accurs nowhere else in his music. In Bach’s usage, as in that of all the composers of the time, there is never any ambiguity in the general naming of the two families of flutes. The family of tranverse flutes is always described by some such term as ‘German flute’, ‘flauto traverso’, ‘traversa’ or ‘traversière’, whereas the simple term ‘fiauto’ (‘flauto’, ‘flute’, ‘flûte’) invariably denotes a fipple-flute, most commonly the treble recorder. In discussions of the fourth Brandenburg, therefore, ‘Fiauti d’Echo’ has been taken to mean treble recorders with an especially soft tone, pitched in F or G, and sounding at the written pitch of the music. Since Bach’s nomenclature is very precise, perhaps it is time to look into the question more closely. In the history of musical instruments, modifying phrases such as ‘d’echo’, or ‘da gamba’ are often powerful enough to effect a change in basic instrumental families. A ‘viola’ is a kind of violin, but a ‘viola da gamba’ is a kind of viol; a ‘tromba’ is a trumpet, but a ‘tromba marina’ is a monochord played in harmonics; a ‘horn’ is a brass instrument, but an ‘English horn’ is neither English nor made of brass; a ‘flauto’ is a recorder, but a ‘flauto traverso’ is a flute. In all these instrumental pairs the names are similar, yet the families are entirely different. It is possible, therefore, that a ‘flauto d’echo’ was neither a recorder nor a tranverse flute but a member of some other family of flute-like instruments”. CONCERTO 5 – “Concerto Traversiere, une Violino principale, une Violino è una Viola in ripieno, Violoncello, Violone è Cembalo concertato”. 1. Allegro / 2. Affettuoso / 3. Allegro. In D Major. Probably composed last. It was probably written to show a new cembalo that Bach had bought in Berlin for the court of Cöthen, built by Michael Mietke (c. 1656 / 71 – 1719). This concerto marks the beginning of the cembalo concerto as a form. CONCERTO 6 – “Concerto 6to à due Viole da Braccio, due Viole da Gamba, Violoncello, Violone e Cembalo”. 1. Allegro / 2. Adagio ma non tanto / 3. Allegro. In B flat Major. Written in 1718. The lack of violins gives a very special color. Gustav Leonhardt, Sigiswald Kuijken, Frans Brüggen, Anner Bylsma, Claude Rippas … (1976 & 1977): the very first good interpretation of the 20th century. Le Concert des Nations & Jordi Savall (1991): Fabio Biondi (violin) and Pedro Memelsdorff (recorder). The Amsterdam Baroque Orchestra & Ton Koopman (1992): elegant. Gustav Leonhardt, Sigiswald & Wieland Kuijken, Fran Brüggen, Lucy van Dael, Anner Bylsma, Paul Dombrecht, Ab Koster, Bob Asperen … (1997): elegant and brilliant. Academy of Ancient Music & Cristopher Hogwood (1997): elegant, brilliant, and virtuoso. Orchestra of the Age of Enlightenment (1999): elegant, transparent, and brilliant. Musica Antiqua Köln & Reinhard Goebel (1999) – virtuoso and spectacular, although by general with the tempi too fast. With a brilliant performance by Andreas Staier. Freiburger Barockorchester & Gottfried von der Goltz (2001 – DVD) – virtuoso, elegant, and alive. Concerto Italiano & Rinaldo Alessandrini (2005): virtuoso, sparkling and brilliant. European Brandenburg Ensemble & Trevor Pinnock (2007): elegant. With the amazing bassoonist Eyal Streett. American Bach Soloists & Jeffrey Thomas (2007): brilliant, elegant and virtuoso. Academy of Ancient Music & Richard Egarr (2009): elegant, brilliant and majestic. English Baroque Soloists & John Eliot Gardiner (2009)- elegant and brilliant, although with too many musicians.